Pictured left to right: Ben Jarvis, Idaho DEQ Pollution Prevention Coordinator; John Genzer, Vista Outdoor Production Supervisor; Carrie Bieren, Vista Outdoor Environmental Compliance Technician. 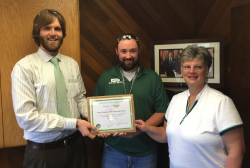 Clearfield, Utah – Vista Outdoor’s (NYSE: VSTO) Lewiston, Idaho facility was recently recognized as “Pollution Prevention Champions” by the Idaho Department of Environmental Quality (DEQ). The award was earned for the company’s successful efforts to reduce pollution at its CCI/Speer ammunition manufacturing facility. The most recent pollution prevention achievement by the Lewiston facility has been the implementation of an in-process acetone recycling and recovery system. This system will allow the company to significantly reduce its hazardous waste generation and reduce the volume of acetone needed for production by over 15,000 gallons per year. By purchasing less solvent, the company is decreasing disposal volumes and reducing the risk of accidental releases into the environment – reducing risks to the environment and its workers. Solvents are ubiquitous in nearly every type of manufacturing operation from metal fabrication to food processing. The company made great strides improving the way solvents are used and managed while also cutting down on the need to transport waste. CCI Ammunition and Speer are a brands of Vista Outdoor Inc., an outdoor sports and recreation company. To learn more about these brands, visit www.cci-ammunition.com and www.speer-ammo.com. Vista Outdoor is a leading global designer, manufacturer and marketer in the growing outdoor sports and recreation markets. The company operates in two segments, Shooting Sports and Outdoor Products, and has a portfolio of well-recognized brands that provide consumers with a range of performance-driven, high-quality and innovative products in the ammunition, firearms and outdoor products categories. Vista Outdoor products are sold at leading retailers and distributors across North America and worldwide. Vista Outdoor is headquartered in Utah and has manufacturing operations and facilities in 10 U.S. states, Puerto Rico, Mexico and Canada along with international sales and sourcing operations in Canada, Europe, Australia, New Zealand and Asia. For news and information, visit www.vistaoutdoor.com or follow us on Twitter @VistaOutdoorInc and Facebook atwww.facebook.com/vistaoutdoor.